FOR MORE than 20 years American Expedition Vehicles (AEV) has been the specialist company when it comes to suppling OE and better quality accessories and complete converted vehicles from the Jeep garage. Starting with the TJ Wrangler and booming through the JK era, AEV provided parts, V8 engine conversions, double cab pick-up conversions and complete turnkey vehicles for anyone wanting top-notch products for their Jeep. With FCA’s own MOPAR brand branching out to market many of these parts, and Jeep developing its own pick-up, AEV has more recently ventured into the RAM trucks showroom and now beyond the FCA brand altogether with the Chevrolet Colorado ZR2 Bison which it co-developed with GM. 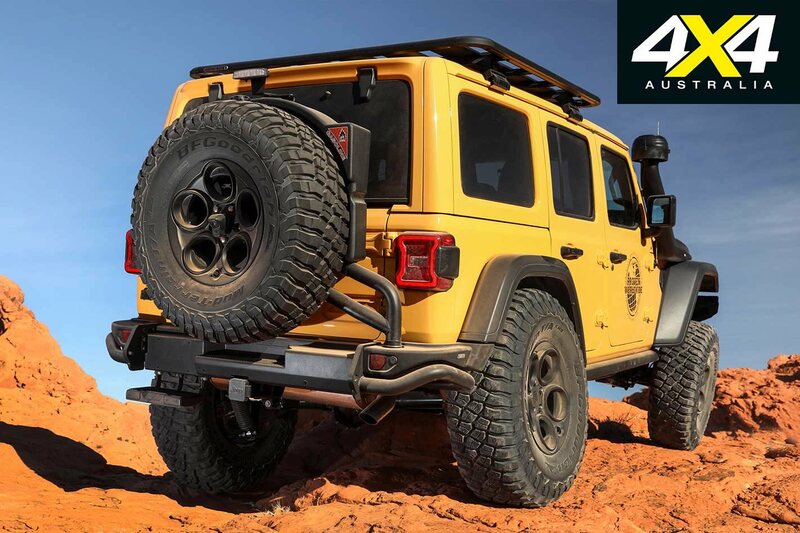 However, the Wrangler was always AEV’s bread-and-butter model and, with the new JL Wrangler available from Jeep, it was only a matter of time before the Michigan-based company revealed its product. 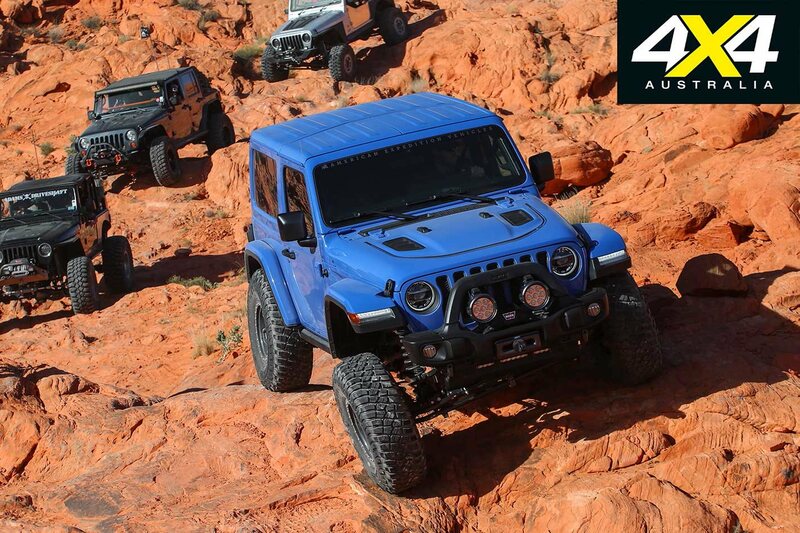 That time came at the 2018 SEMA Show in Las Vegas, where AEV displayed both long and short wheelbase JL Rubicons featuring its new gear. And, as we’ve done in the past, we took the Jeeps wheeling the day after the show finished. The long wheelbase four-door is a Rubicon model which has been custom-painted in a colour they call Sand Glow. It’s not a Jeep colour, so don’t go asking your Jeep dealer for it. It features the AEV DualSport RT suspension which gives a 2.5-inch lift in ride height, new AEV front and rear bumpers, 17 x 8.5-inch AEV Savegre wheels wrapped in 37-inch BFG KM3s, and the newly designed air-intake snorkel. The bumper is modular and uses a common centre section, while the outer ‘wings’ can be tailored to needs and wants. This allows for a full-width bar as on the LWB, or a stubby bar as on the blue SWB. Jeep offers the JL with different front flares depending on the model and, again, there are different bar wings to suit to ensure they meet up. The JL Rubicon comes with the factory highline flares, which are wider than the lower flares, to cover larger tyres. The Savagre wheels will be familiar to AEV fans and, along with the Salta, Pintler and Borah wheels, will all be available for JL. They have been modified for the new car with a larger centre opening, which allows the reversing camera to poke through the spare wheel mounted on the back. The spare is mounted on the AEV rear bar with its swing-out wheel carrier. This bar is similar to the design of the previous JK bar but now incorporates a fold-down step and doesn’t include the water tank in the bar ends. AEV says it is looking at other water-carrying solutions for the JL, and the other side of the bar has been left bare allowing for the possibility of dual swing-out carriers in the future. This is unconfirmed at this stage, but the bar has been designed to accept it if the company goes ahead with it. The blue shorty is kitted out pretty much the same way as the LWB Rubicon in that it is set up for long-distance touring and expeditions. It has the AEV bars front and rear, with the front bar configured as a stubby. 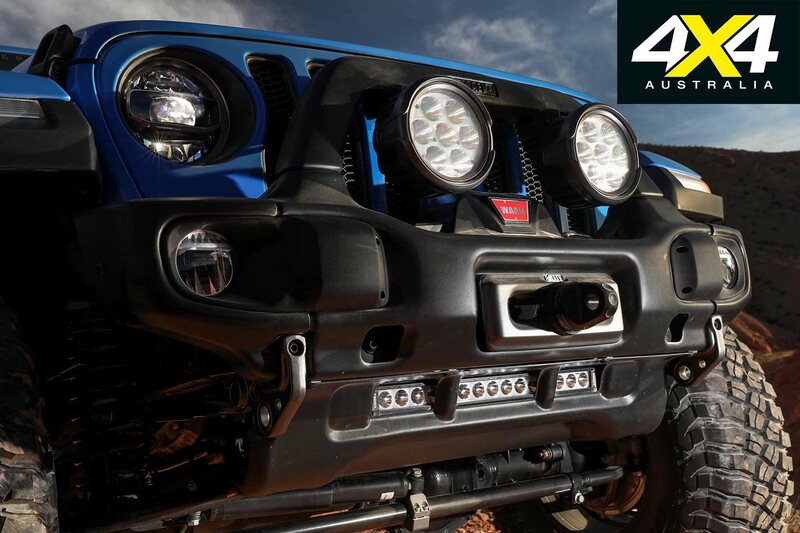 The bars on both cars mount prototype seven-inch LED lights, which will be a future product from AEV, as well as Warn winches with Factor 55 hitches. The SWB Rubicon also has the DualSport RT suspension but the wheels are AEV Borah beadlocks, again with the bigger centre hole to allow the rear-view camera to fit. The AEV beadlock wheels can operate as both a conventional unlocked bead or with the ring fitted to lock the tyre on. The colour is once again not a Jeep offering, but it is in the family. It’s called New Holland Blue and is a limited edition colour on some RAM trucks. 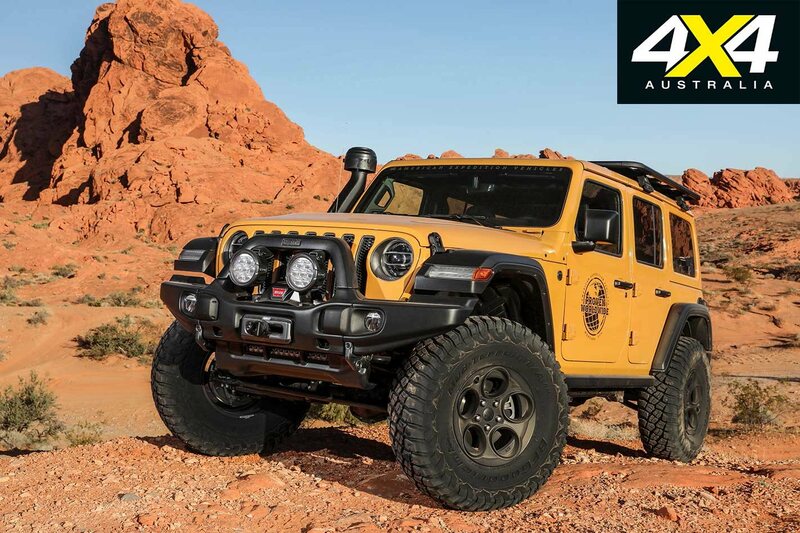 While it might appear to be business as usual for AEV with its new line of JL products, there are a couple of items it won’t be doing for this latest Wrangler. With the launch of the Jeep Gladiator, which looks amazingly similar to the AEV Brute Double Cab, AEV will not be doing conversions on the JL. You can expect AEV products to improve the Gladiator once the vehicle is on the market, though. The other big-ticket item is V8 conversions, which were always popular on the TJ and JK models. AEV says that with the different engines now offered on the JL – the petrol V6, turbocharged petrol four-cylinder, the soon-to-come diesel V6, and a four-cylinder diesel in Europe – there will be a lot more time and expense required to develop the conversions for each of the different OE engine options; so at this point there are no plans for JL Hemi swaps. 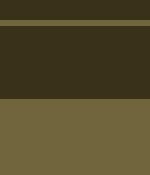 That might change in the future, but there’s nothing for now. AEV developed the original heat reduction hoods for the JK Wranglers which MOPAR and Jeep later adopted as factory offerings. With this in mind, there are no plans for any AEV hoods for the JL. The JL Wrangler is set to launch in Australia this March, and the approved AEV dealers in Melbourne and Brisbane should be carrying stock for these vehicles. All times are GMT +10. The time now is 12:04 PM.